I write to her when I have something newsworthy, which is usually several times a year. In return, for the last few years, I have received one of Margaret’s original holiday cards and a yearly newsletter. As she recommends: “personalize those newsletters with a few handwritten lines.” And so she does with her calligraphic words of personal encouragement just for me! 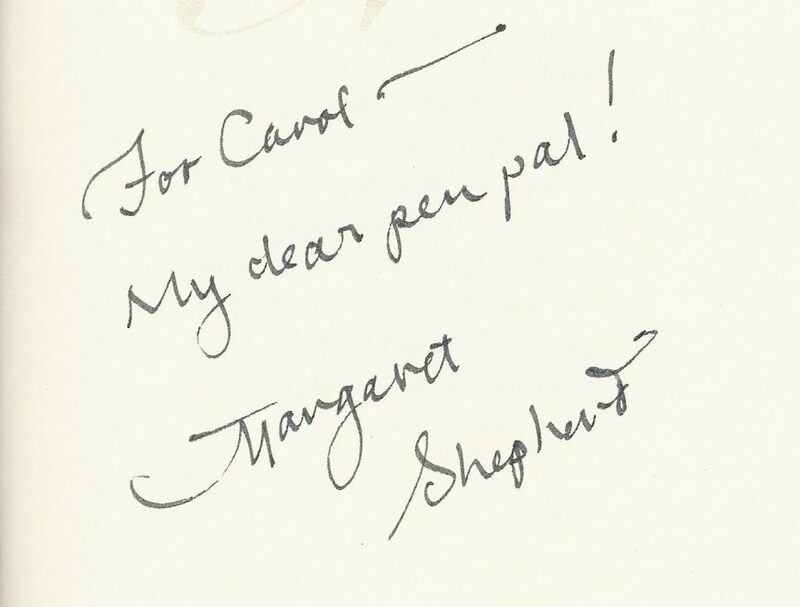 I can’t recall how many of Margaret Shepherd’s books I have purchased as gifts. 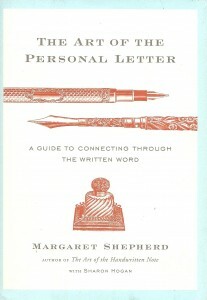 In this age when manners hardly exist anymore, I feel relieved to have The Art of the Personal Letter, The Art of the Handwritten Note, and The Art of Civilized Conversation– to hold a standard for polite human interaction, with a central focus on letter writing. Needless-to-say, I refer to her books often. I learned from Margaret’s newsletters, that she is married to David Friend. I noticed in a recent Peabody Museum catalog that David Friend was funding a new hall at the museum to showcase a collection of large minerals and gemstones. I live nearby and asked Margaret if I might be invited to the opening. An email followed from the Peabody for October 13th. Wow! The opening was amazingly crowded. Not being very tall, I couldn’t see the speakers. The acknowledgements took about an hour. David Friend spoke saying that his Dad had given him a hammer to discover minerals as a boy. He still has that hammer! Finally, the ribbon was cut, the gallery opened and the crowd flowed inward. I didn’t know anyone. The room was extremely dark. Finally, I saw David Friend posing for photos by the huge quartz crystal pictured above. I heard people addressing him as “David, ” so that was key. When a young woman came over and leaned on David for a photo, I recognized her from one of Margaret’s newsletters. I circled around a few times till I spotted the gal and said, “Hello. Can you tell me where Margaret is?” She graciously pointed to her right, and Margaret Shepherd turned around. “I’m Carol Christmas,” I said. She responded, “Why is that name familiar?” “I write to you,” I chirped. Recognition brought me a big smile and a hug. She announced to those around us, “She’s written to me for 20 years.” That was a bit exaggerated but I felt pleased that she thought we went back a long way. We spoke briefly. The room was quite noisy. I asked her if she would sign my three books. She had her trusty pen and we found a drinks table to accomplish the task. I had written her a letter which she quickly deposited in her Vera Bradley backpack. I also carried a Vera Bradley bag! When Margaret was finished signing my books, she reached into her bag and gave me another gift, one of her business cards. 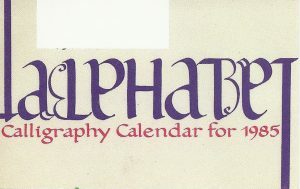 It’s an ambigram. It’s it cool?